In the Fall of 2014, McMaster University Library joined the OCUL/Scholarsportal “Ask a Librarian” online research help service. 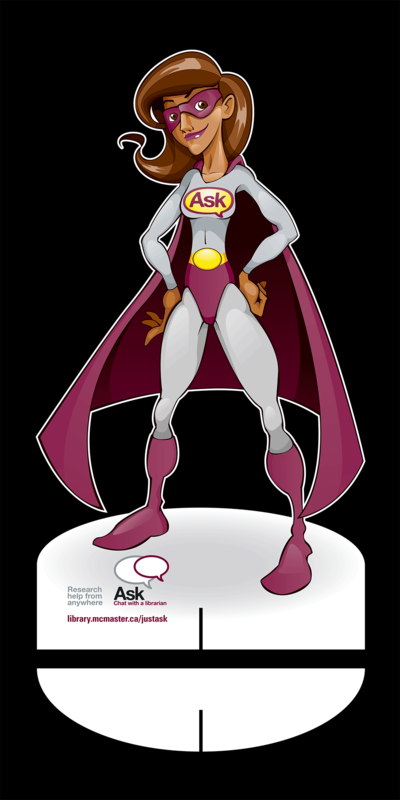 To promote the service, the “Ask” marketing team at McMaster decided to go with a superhero theme. A stock photo was sourced, and colours were tweaked. One of the key elements was a large, stand-up figure that was human sized, and other art was produced, including bookmarks, displays for computer screens and table-top sized stand-ups.